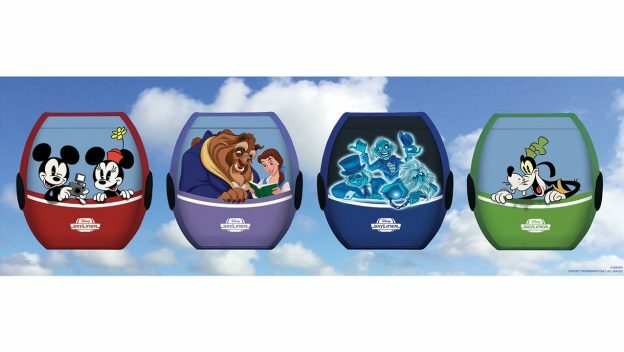 Back in July at the D23 conference, Disney World’s newest form of transportation was announced: the Skyliner, a gondola connecting Epcot and Hollywood Studios with several Disney resorts. Since then, we’ve been daydreaming about flying between resorts and parks, taking in the views from above. And now we have some new details to pore over — plus some exciting concept art — courtesy of the Disney Parks Blog! First, select ride vehicles (called cabins) will celebrate beloved Disney characters — from the Fab Five to princesses to our favorite Hitchhiking Ghosts! Snagging one of these cabins is already on our Disney World bucket list. The Blog also shared some concept art for three of the stations the Skyliner will use. 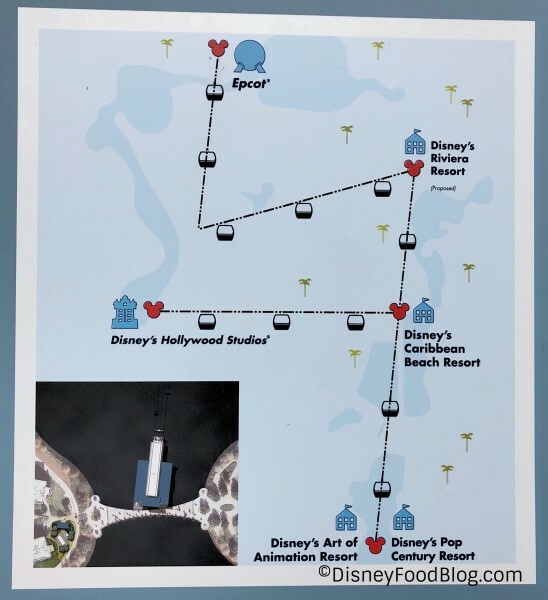 Stations will be found at Caribbean Beach Resort, Epcot’s International Gateway, and Hollywood Studios and will also connect Pop Century, Art of Animation, and the new DVC Resort — Disney Riviera Resort. 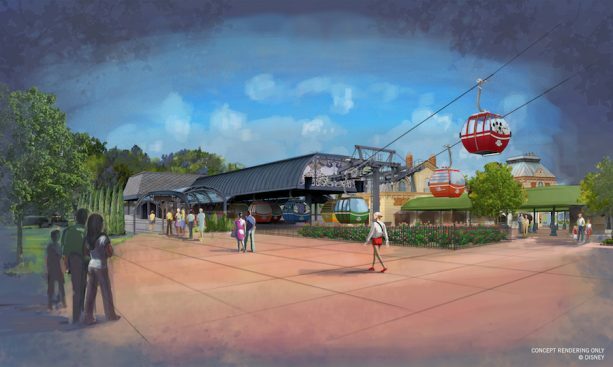 There will also be a ‘turn-station’ located on Buena Vista Drive, where guests will be able to “see the mechanical and aerial components that make up the Disney Skyliner.” So cool! 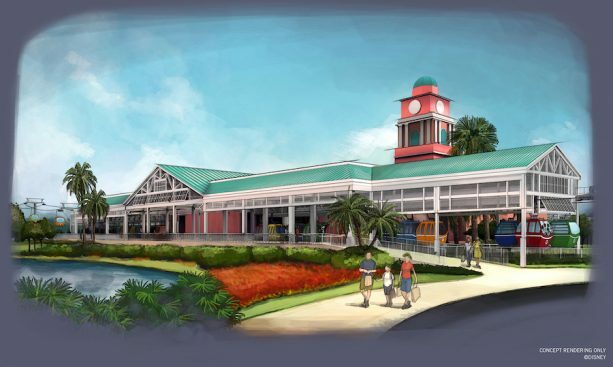 The Caribbean Beach station will feature the fun and colorful designs you find at the resort itself. 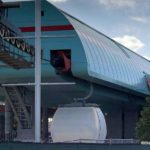 And the Blog says this station will be “the hub of activity” for the Skyliner. 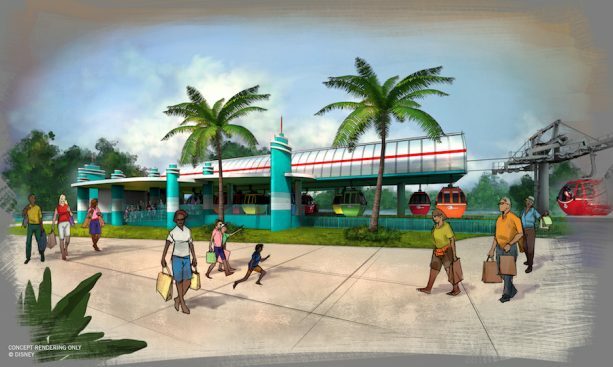 The Hollywood Studios station will mimic the retro DHS entrance and bus stop design. The Epcot International Gateway station will capture the beauty of the Pavilions located near this part of the park. 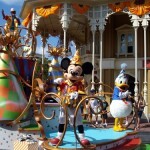 Want to hear more amazing things coming to Disney World?? Click Here to See More Incredible Lands, Resorts, Hotels (Including The Star Wars Hotel!) 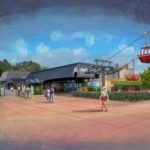 and Attractions Coming Soon to Disney World! How excited are you for the Skyliner? Squeal with us in the comments below! « News: Raglan Road Celebrates National Lager Day With Blagger! I have to be honest. Not a fan. Just doesn’t seem practical. They had a Skyway and they didn’t learn from that. We’re looking forward to the Skyliner! An additional transportation choice and the views of property will be amazing! I remember getting on the skyway in Tomorrowland and exiting in the little Swiss chalet where Rapunzel’s tower now is, as a kid. I thought it was so cool! I’m excited for this new system, I think it’ll be amazing! Looks fun…just a little worried about all those rain storms in central Florida. I wouldn’t want to be stranded up there!! Kelly D — I thought the same! It might be “down for weather” throughout hurricane season! Chris, no word yet! 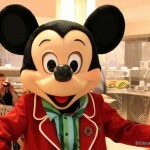 The Disney Parks Blog just says to follow them for more details in the future. I remember the original skyliner at Magic Kingdom . I loved it !! So happy it will be coming back to the resorts for an awesome exprerience. 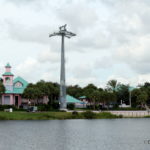 The Skyliner going to the International Gateway is a horrible idea! It’s a small entrance made for the Epcot resorts. It was never intended to hold masses of people from the value resorts which will now go up in price with this new transportation option. So those of you cheering this addition don’t complain when you start paying for it! The IG entrance was the last quiet spot in WDW now ruined so keep saying I can’t wait, your favorite Disney spot will be ruined soon enough! IG way too small to handle this traffic. IG was built originally for just the Yacht/Beach club and trams would move people to the gate. Then Swan & Dolphin added, then Boardwalk. Hopefully they will expand the entrance. Also read these won’t be air conditioned? That’s crazy. I think this looks fun as an attraction, especially for the views. Themed cabins will be cute. I also think that the IG area is insubstantial, as-is, to accommodate the number of Guests I anticipate will want to dis/embark there. I also think that rack rates will rise for properties connected with the Skyliner. What’s most frustrating for me, though, is that ~ judging by the concept art map ~it will still be a grossly time-consuming way to get from A to B. So, I will definitely ride this a few times for the experience (like the monorail), but I will stick with Lyft to actually get from hotel to park and park to park (MK excluded, of course). My family was at D’World earlier this month (August 2018), and we definitely benefited from Lyft. While on vacation, it drives me absolutely insane that I’m wasting very precious minutes standing around waiting for transport with no published time table that runs infrequently anyway, especially after a long day of enjoying the Parks. Standing for 20 minutes waiting for a bus that will spend an additional 5 minutes loading scooters and then will fill to capacity (standing room only) for a 20 minute ride is NOT vacation to me. By the time the bus arrives at a park and has embarked all passengers, I’ll already be back at my hotel. To me, it’s worth it.